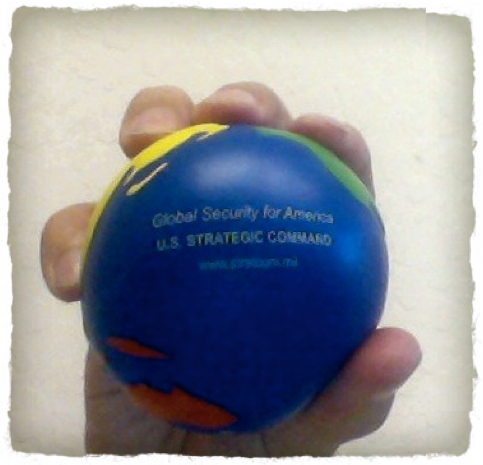 US Strategic Command, the institutional owner and conductor of the American nuclear arsenal, gives out knick-knacks at its (semi)public events: pens, desk toys, lapel-pins – what Lynn Eden refers to as “tchotchke” and I prefer to think of as “swag”. I learned this a few months ago, at “StratCom’s” annual ‘Deterrence Symposium’ in Omaha, Nebraska, where the senior suits and brass of the US nucleocracy gather to reassess and reaffirm their raison d’être. These goodies appeal to me in a sardonic sort of way. To my mind, at least, their mundanity belies StratCom’s apocalyptic purpose, and testifies to the intellectual distance that nuclear interlocutors have created between themselves and their abysmal subject matter. I spent my breaks amassing a small arsenal of swag, most of which now adorns my apartment in Bristol. Pride of place in the new collection is a ‘stress ball’ painted like a globe with StratCom’s logo on it: a miniature world you can hold in the palm of your hand and casually crush when you’re under pressure. Anyone at the symposium in search of a metaphor would not have had to look far. The ball reminds me of Weber’s misgivings about bureaucracies and their structural indifference to moral purpose. Deterrence and introspection have never been compatible. Omaha is littered with missile silos, each controlled by uniformed men and women who pack the kids off to school every morning and then report to their bunkers for duty, fully prepared to end the world should duty require. The organization to which they report hands out branded stationary. We traditionally think of the advent of nuclear weapons as a problem for security researchers, but perhaps the most pressing questions it raises are sociological and anthropological. They have to do with our relationships with institutions, and our institutions’ relationships with the societies they ostensively serve.